NMH MUN Greece Team Arrives! And trip leaders, Jensi Rovang '08 and Grant Gonzalez! The Model UN Greece team left the NMH campus around 5:00PM on Sunday night. After arriving in Boston Logan airport, we met briefly as a team to talk about expectations and our adventure ahead. With most of America watching the final minutes of the Super Bowl, we boarded for the first leg of our journey to Istanbul. The night flight was nearly empty, so some of us were able to get in a few hours of sleep. 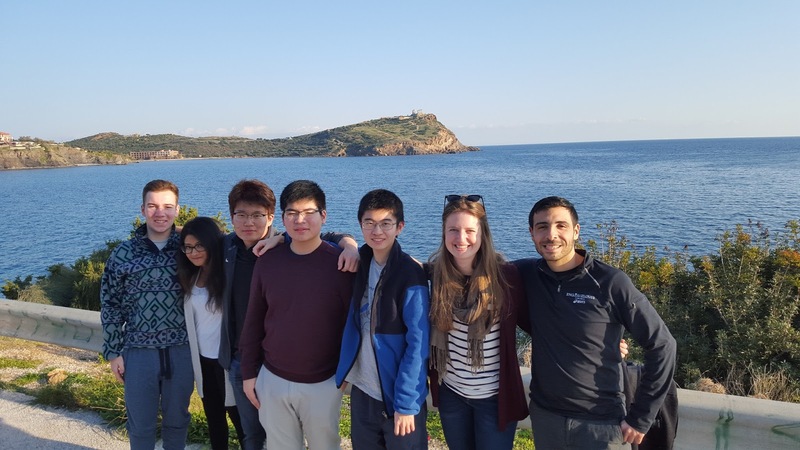 However, as Trung noted, "after a tiring journey spanning nearly 5,000 miles and across 7 time zones, the team [was] ready for a good night sleep in preparation for our first full day in Athens," on Tuesday. The group woke up bright and early today to get to breakfast by 8:30am. At 9:30am, we met up with our driver, George who took us through Athens to the Praksis office, Praksis is a non-governmental organization that works to help people who are either disadvantaged or discriminated against. There, we met with a woman named Dina who told us a little bit about Praksis' work. We also had a chance to ask her questions about how the economic crisis in Greece and the refugee crisis affected their organization. We concluded learning about Praksis by going to an actual day center where the organization helps the people they aim to serve. Following our meetings with Praksis, we had lunch, and made the journey southeast to the Temple of Poseidon. Honestly, the Temple of Poseidon was one of the most incredible sights I have ever seen. We were lucky enough to be there on a cloudless, mid-60 degree day, and catch the sunset over the ocean. We concluded our first full day in Athens with dinner near the base of the Acropolis. Our visit to Praksis, an NGO helping marginalized populations within Greek society, was an eye-opening introduction to our stay in Greece. Talking to various members of the organization gave us a general understanding of the consequences of the economic crises in Greece, as well as the influx of arriving refugees. Reading about the migrant crisis and hearing experiences from someone who has first hand experiences with the people in need are completely different. We were fortunate enough to tour Praksis' Day Center for Homeless people where different basic services were provided. Praksis emphasizes the fact that they provide their basic services with "no discrimination" meaning to all in need regardless of race, sexuality, gender, religion etc, something that resonates deeply with our NMH philosophy. It is empowering and thought provoking to converse with people who are passionate about helping the world become a better place and are actively taking step to do so. While at NMH we are often aware of such issues, there rarely exists a step of action. The Praksis volunteers embodies the qualities of the Hand that we usually don't have the chance to exemplify at NMH. On Wednesday we have a full day of seeing Athens, before we catch the short flight to Thessaloniki!